The Party of Science is, as you know, the Left, and they are quick to call out (correctly so) the knuckle-draggers on the Right who place faith above reason: the right is absurdly antiquated on any number of issues — ranging from gay marriage (which, incidentally, the left was also against, for 238 years, before, unlike those of us who believe uncompromisingly in laissez faire, they were suddenly for it, beginning about four years ago), to human sexuality, to God-in-the-Constitution, to much more. The left, however, is hardly more scientifically enlightened. In fact, their knuckle-dragging equals or eclipses the right in manifold areas — nuclear energy, for example, the woeful (mis)understanding of how much hard-core fossil-fuel energy goes into making and sustaining all forms of so-called renewable energy; how filthy with externalities the “clean” energy racket really is, and much more. But it’s in the realm of economics — the science of production and exchange — that the Party of Science is found at its most knuckle-draggingly unscientific. I’m talking about basic economics, mind you, and not the more complex theories — Marx’s thoroughly discredited Labor Theory of Value, for example, which many on the left still inexplicably cling to. I’ve recently been criticized a little over my use of that term — it being all of seven years old now, you see — but I’m here to tell you that the mentality behind it is not only alive and well: it’s stronger than ever. This movement persisted for over a year, and it was based entirely on an elementary misunderstanding of an economic law — a law so elementary, in fact, that the left’s misunderstanding of it makes the right-wing position on, for instance, evolution look halfway normal. The so-called 1 percent is singlehandedly responsible for creating all the wealth from which the 99 percent prospers — wealth put into full use during the whole movement: televisions, cameras, computers, tablets, iPhones, Androids, social media, reliable transportation, plumbing, concrete, clean food (which was trucked in by means of fossil fuel), clean water, the infrastructures providing clean water, shelter, state-of-the-art medical facilities, and much, much, much, much more. America, incidentally, though 50 percent socialized in medicine already, as it has been for a long time (driving up the costs astronomically via economic laws neither the Right nor the Party of Science can apprehend), is still, because of the 50 percent that hasn’t yet been socialized, the country everyone comes to for major medical procedures: all the princes and princesses and premiers and presidents and sheiks and kings and queens and movie stars and sports stars and everyone else, if they need heart or brain or spine surgery or cancer care or any one of thousands of other things, they do not go to Cuba, they do not go to Russia, they do not go to China, they do not go to England, or Australia, or Japan, or France, or Canada, or Scandinavia. They come to America for America’s technology and America’s doctors, which the so-called 1 percent created and sustains. All these things and innumerable others besides — including most importantly any number of job markets in which the 99 percent work — are created by the capital and capital investment and the wealth of the 1 percent. Capital and capital investment ALONE creates wealth. It creates innovations. It creates production and inventions and jobs and the division-of-labor and vastly greater transmission of knowledge and everything life-sustaining. Equally important — and please take a moment to process this as well — the 99 percent scale is still in America not fixed. This is crucial, and it is entirely missed by everyone within the movement to whom I’ve ever spoken. Through hard work, persistence, and good ideas, anyone and everyone is perfectly free to move up that scale — all the way to the 1 percent. And people do, all the time. It happens all the time in America, every single day, that people go from nothing or very little to abundance. This, by the way, is one reason that the 1-percent-99-percent statistic is not quite accurate. It fluctuates, but the mean is more like 3-percent-97-percent. It needn’t stay there, however. It’s not locked in, and the more wealthy people there are, the more innovation and invention and progress there will be. The primary things that determines it are ambition and good ideas that people willingly pay for. Prosperity happens under systems of freedom. That is observable, evidence-based data — as is the fact that heavy taxation, socialization, inflation (i.e. money printing), licensing law monopolies and many other state-created things, they stifle prosperity. In socialized countries they call this The Brain Drain. “All of us, 100 percent of us, benefit from the wealth of the hated 1 percent. The protesters are literally kept alive on the foundation of the wealth of those whom they protest and hate…. For one small example, the fuel that powers the tractors and the trucks and the airplanes and the trains that power production and delivery of the food the protesters eat. The protesters and all other haters of laissez faire hate and protest the foundations of their very existence” (source). As I’ve said before — and can never say enough — there are 5,000 arguments against laissez faire, and every single one of them is predicated upon a fraudulent premise, which is in turn usually predicated upon The Entrenchment Fallacy. Some of the smartest people I know and some of the smartest people I’ve ever heard and read believe in total, unadulterated laissez faire, and I can absolutely assure you that any objection you might think of has been thought about and considered in great, great detail: whether economic or political, whether ethical or legal, whether environmental or civic, it’s been considered and addressed. It’s been discussed and written about so exhaustively, in fact, that the amount of data on the subject has long outstripped any one person’s ability to read it all. And it will continue to be addressed and elaborated. You will not think of something new that will in turn justify the legal violation of person and property as a tenable social system. You will not think of something that suddenly makes political corruption and lying and political pandering and 100,000 pages of bureaucratic legislation good government. Dismissal, prevarication, ridicule — the most common ways the majority of people deal with laissez faire — these do not touch it. These don’t alter the facts. Nor does ignoring and avoiding the arguments alter the facts. Also, behind every major victory for personal liberty — legalizing gay marriage, for instance, or pot legalization, justice for Native American children, or allowing insurance companies the freedom to trade across state lines, abolishing all trade tariffs, et cetera — you will find there the bedrock principles that undergird laissez faire. You will not find leftwing or rightwing politicians — and, make no mistake, liberal politicians have thrown as many people in jail for prostitution and pot as conservatives (probably more), who have also thrown countless thousands into jail for such non-crimes. Ultimately, though, the reason laissez faire triumphs is not because of more skillful argumentation or polemics or debate. Laissez faire triumphs, rather, because it is right and it is just. Laissez faire arises naturally out of humanity itself. It is not created. It’s what happens naturally when people are left alone. Through the inalienable right to person and property and through voluntary exchange, trade, and transactions, people are perfectly free to become wealthy — and the anger and envy of those who have not become wealthy does not negate this basic freedom. We are each individuated and sovereign, and we each have a property in our person, and property is an extension of person. This is why anyone who actually cares about what’s just and good and (scientifically) right will inevitably be led back to laissez faire. Hi Ray, I do not know if you will remember me or not, but I ran cross countery and track with you at the University of Wyoming. For some reason, you came to mind the last couple of days and I did a Google search on you, finding this website and that you have been writing some books. 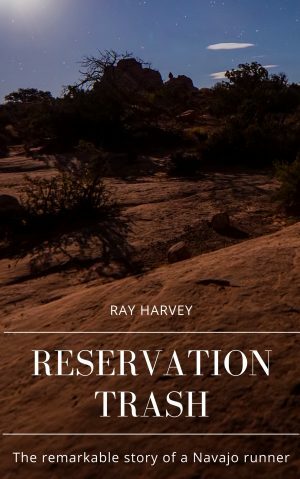 I Purchased Reservation Trash yesterday and have almost completed it. Your words have brought so much to my mind. One of which is this video, as a result of your words that the meaning of life is work: The Labor of Love – https://www.youtube.com/watch?v=HvCV4-siLKM . Also, much of what you have written about makes me think that you might find thought-provoking this book which has seriously impacted my life: https://www.amazon.com/dp/1574556924/?tag=googhydr-20&hvadid=186807025352&hvpos=1t1&hvnetw=g&hvrand=14541464914680013528&hvpone=&hvptwo=&hvqmt=b&hvdev=c&hvdvcmdl=&hvlocint=&hvlocphy=9032827&hvtargid=kwd-3703087634&ref=pd_sl_5f2tieow5t_b . There is much in that book about the human person, human rights, politics, economics, the environment, etc. If you can get past any preconceptions of the Roman Catholic Church, you might find something of value here, too. It contains milleniae of human wisdom. Seriously, I would very much like to have a conversation in some manner (e-mail, phone, both, or ?) about all of this. I do not presume to know from briefly looking over your website and reading most of one book to understand completely where you are coming from. I would like to find out more and perhaps learn from each other. Hiya Chuck! I do remember you. I remember you very well indeed. Thank you for buying Reservation Trash, and thank you for remembering me — and for taking the time to write me such a thoughtful comment. I hope you’re still running.